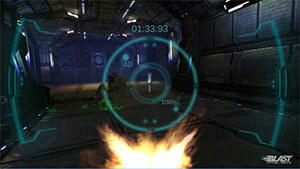 A first-person shooter tech demo developed with support for BlastVR B1 Bluetooth gun controller. Find yourself on a damaged and seemingly abandoned space colony station. You have been sent to find out what happened to a crew based in a space settlement station. Featuring fast-paced action arcade gameplay, and although it can be played with other Joypads & joysticks, the best immersion is when played with the B1 gun controller. 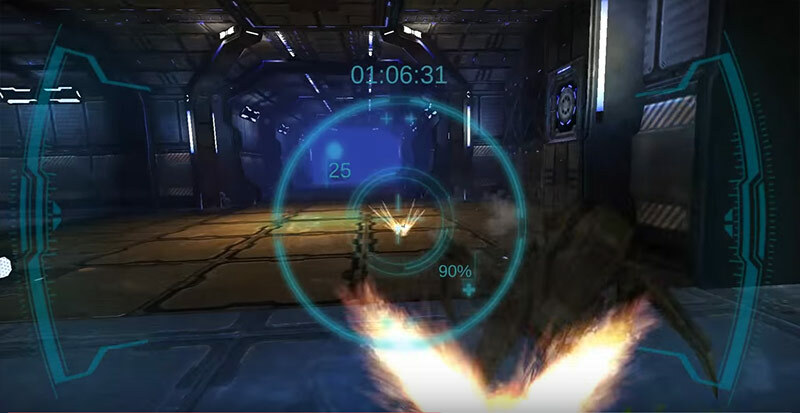 Lost Contact VR - BlastVR B1 is a Virtual Reality game that was developed by BlastVR and is optimized for use with the company's Bluetooth BlastVR B1 gun controller. We hear about new VR controllers almost every day, but this one was actually designed to give you the most immersive and intuitive gameplay experience when playing first-person shooters. The main reason for that it because it is designed like a real gun. It has a gun grip, a sliding reload part, integrated 4-way joystick, a grip release, power button and Picatinny rail, a trigger, status LED and dual option buttons. Lost Contact VR game was can be played with other Bluetooth gamepads and joysticks, but it's optimized for the BlastVR B1 controller. It was designed to work with mobile and VR headsets, but can also be used with PC and Mac platforms over Bluetooth wireless connectivity or wired, using a USB adapter. The BlastVR is also customizable, allowing you to attach extra accessories to the top rail, has a removable handle which you can use a 3D printer to print your own, and it has a rear dovetail mount, which again, you can print your own 3D printed stocks and other parts to make it more ergonomic and fit your playstyle. As of the time of writing, the controller has a single game, Lost Contact VR - BlastVR B1, which allows you to experience how it is like to play a game with this controller. It was released for Android as a free-to-play game, which you can download via Google Play. Lost Contact VR - BlastVR B1 isn't a full game, but rather a tech demo that was designed to demonstrate the controller's capability when playing the game wither either the Samsung Gear VR or Google Cardboard headsets. The controller doesn't have a built-in gyroscope, and it relies on the mobile device to provide it with this orientation data. The gameplay is pretty straight forward, you choose your gun, either an assault rifle or an assault shotgun, choose a difficulty mode (easy, normal or hard) and press the controller trigger button to start playing. Your goal is to discover what happened to the crew which was positioned in a seemingly abandoned space colony station. The gameplay feels kind of like Aliens, where the crew arrived at a station after a radio communication with it has been lost. The game was developed with Unity3D and has pretty nice graphics and immersive mysterious atmosphere. You'll be shooting spider-like alien creatures as you traverse through the station corridors. The harder the game mode, the more intensive it gets, and the harder it is to progress. The game records you best attempt, both the time you stayed alive without dying, as well as the number of creatures you've killed. I really like seeing new types of VR controllers, and as a big fan of FPS games, I'm thrilled and looking forward to seeing more games for this, what it seems, like a very capable controller for both mobile and desktop shooter games. This is just the start, and Lost Contact VR - BlastVR B1 an excellent tech demo to demonstrates how immersive and intuitive it is playing a Virtual Reality game with a unique controller which was designed from the ground up for these type of games. So my first impressions are really positive and I recommend people trying the tech demo when the BlastVR B1 controller comes out.